Delightful Designs by Danielle: Whoooo loves you? Another quickie card for you tonight. I managed to get this sweet valentine card done on Monday ... and lucky for me it was sold by the end of the day to a colleague at work! This cute owl is a new addition to my collection and is coloured with copics. 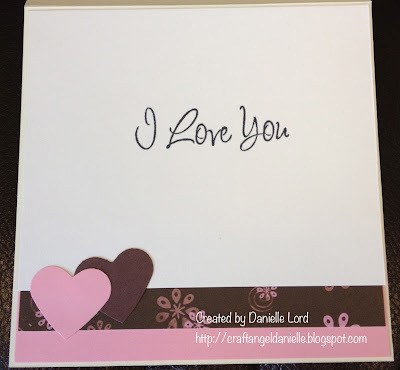 I love the pink/brown colour combo and I punched out loads of hearts using my MS heart punch. The sentiment is from stash. Here's the completed inside panel of my card. 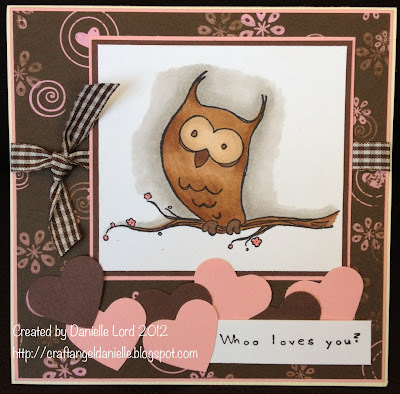 Whoooo loves you? I LOVE YOU! So cute isn't it! Again, pulled the papers and colours and punched hearts from the main panel to complete the inside look. Thanks for stopping by ... I so appreciate you coming by and I hope my schedule eases up some so I can spend a little time playing blog catch up! Not sure when that will be as hubby jet sets off to Japan at the weekend for a weeks business trip ... sigh! Take care and hope to see you all again here soon! Fabulous card!! Love all those cute hearts!! And the inside is perfect! p.s. sorry I disappeared again. this winter is taking all of my energy. Oh this is so cute Danielle.